While all Waitrose recipes are tested extensively, we do not test any community or third party recipes, so cannot verify the results or answer queries concerning them. 1. First, make the pastry (although do feel free to buy it if you’d rather): cut the cold butter into cubes, add it to the flour and season well. Gently rub in the butter using just your fingertips until the mixture resembles breadcrumbs. 2. Add the egg and a couple of tablespoons of cold water to the mix – you’ll need just enough to bring it together into a rough dough. Wrap the dough in clingfilm and pop it in the fridge to rest while you make the filling. 3. To make the pie filling, heat the oil in a large heavy based pan and fry the chopped onion until translucent, then take the meat out of the sausage skins and add into the pan. Fry gently, breaking up the sausage meat, until it’s golden brown. Tip the mixture out into a bowl, then pop the pan back on the heat and add a generous splash of Marsala to deglaze the pan, scraping up any stuck bits from the bottom of the pan with a wooden spoon. 4. Add the sausage mixture back in, along with the shredded turkey, chestnuts, ham and cranberries. Stir together then pour over the chicken stock and swirl in a generous glug of double cream. Cover the pan, turn down the heat and allow to cook for about 20 minutes. 5. Turn off the heat, then allow the filling to cool completely while you roll out the pastry. Divide the pastry roughly in two and reserve half for the lid. Roll out the base to about 5-6mm thick, moving the pastry around in 1/4 turns as you roll until you've got a rough circle. Roll the pastry up around the rolling pin, then unroll it over your pie dish. Push it down gently, and use little extra bits to fill any holes or cracks. 6. 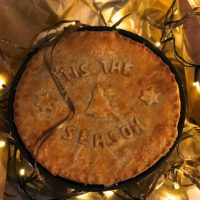 Using a slotted spoon, pile the cooled filling into the pie (if the filling is still warm it will begin to melt the butter and you'll get the dreaded 'soggy bottom'). Reserve the extra gravy to serve at the table. Roll out the pastry lid, then top the pie and crimp the edges with your fingers, or a fork so that they're sealed together. If you want to decorate the pie, stick your design to the pastry with a little beaten egg, then give the whole lot a final egg wash. Refrigerate the pie until needed. 7. To cook: preheat the oven to 180/gas 4, then bake for around 45 minutes or until golden brown. Et voila, a stunning way to wow your festive guests and make leftovers into a celebration meal in their own right.